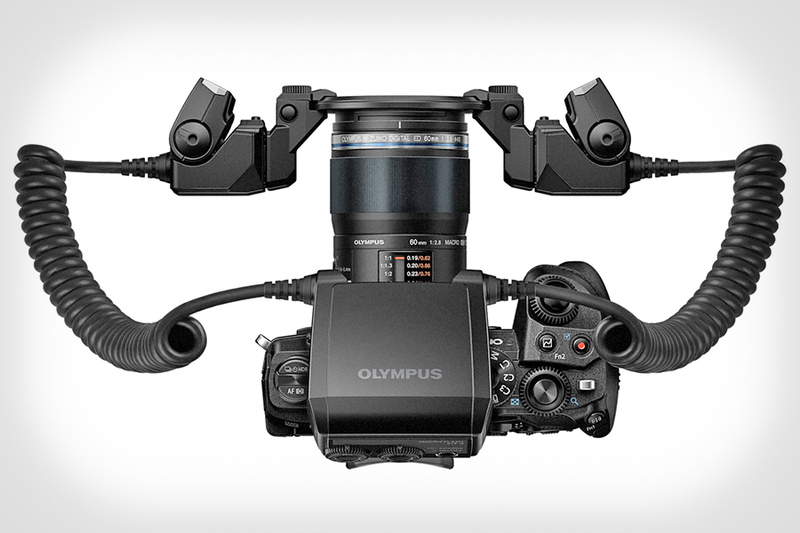 Olympus announces the STF-8 Macro Flash, the world’s first macro twin flash with weatherproof construction. This compact and lightweight flash is dustproof, splashproof and freezeproof down to 14°F (-10°C) so that photographers may take advantage of every photo opportunity without worrying about their gear. Twin flashes tend to be large, heavy, and lack dustproof and splashproof capabilities, making them virtually impossible to use in many outdoor environments. The compact STF-8 combines with the weatherproof performance of the OM-D® E-M1 Mark II camera and M.ZUIKO® lenses to capture properly illuminated macro shots wherever your photography takes you, even outdoors in the rain. The STF-8 offers unparalleled flexibility and is compatible with the M.ZUIKO Digital ED 30mm F3.5 Macro, M.ZUIKO Digital ED 60mm F2.8 Macro and M.ZUIKO Digital ED 12-40mm F2.8 PRO lenses. The STF-8 boasts a guide number of 8.5 when firing both heads and 6 when firing one head to deliver ideal flash output for macro shooting. In addition to full TTL auto sync, users can manually control the output from full power down to 1/128. The ratio between the left and right heads is fully adjustable, allowing for superior versatility to fine tune lighting for limitless creative possibilities. The heads are also removable; users may position one to light their subject and the other to light the background, or utilize any positioning combination to match the shooting scenario. Designed to support various shooting techniques, the STF-8 is compatible with Focus Bracketing and Focus Stacking modes on select OM-D models, including the OM-D E-M1 Mark II, to further expand photographers’ creative expression. The STF-8 Macro Flash incorporates the same hermetic sealing technology found on Olympus cameras and lenses to deliver the world’s first dustproof, splashproof and freezeproof (down to 14°F / -10°C) construction on a macro flash. When combined with the weatherproof performance of select OM-D cameras and M.ZUIKO lenses, photographers have a compact macro system they can use with confidence in any environment. In addition to compatibility with three M.ZUIKO lenses, third-party step-up/step-down rings can be attached to allow you to use a variety of lenses, including four thirds system macro lenses. Both of the flash heads may also be adjusted for versatile angles and shooting distances. Flash output ideal for macro shootingA guide number of 8.5 when utilizing both flash heads (a guide number of 6 when firing one head) provides a high level of control over exposure and makes it easier to avoid overexposure at close focusing distances. Users are no longer required to keep the flash heads far away from the subject or unnecessarily stop down the aperture.In addition to full TTL auto sync, users can manually choose the output (from full power down to 1/128) for fine control over the balance of flash and ambient light. The heads are also removable to properly light every shooting scenario. Superior versatility for expanded macro-photographic expressionsThe flash ratio between the left and right flash heads (A/B) is fully adjustable. Photographers will never feel limited in their ability to control highlights and shadows across their subject. The A/B output ratio (either fire one head or adjust from 1:8 to 8:1) and manual flash output are designed to be controlled quickly and intuitively via two dials on the control section.The angle of the flash heads may be adjusted from 60° upward to 40° downward, and may be rotated around the ring adapter. Advanced lighting techniques may be achieved by removing the flash heads for lighting backgrounds and lighting subjects from behind. The flash heads can also be individually mounted to a tripod using the built-in socket.The included retractable diffuser softens flash output for smoother shadows and a wider angle of coverage. This is effective for shooting extreme close-ups with a wide aperture or when shooting with a wide-angle lens. The STF-8 is designed with the lens working distance in mind. Because the flash heads do not protrude beyond the end of the lens, they never come in contact with the subject, even when shooting extreme close-ups. 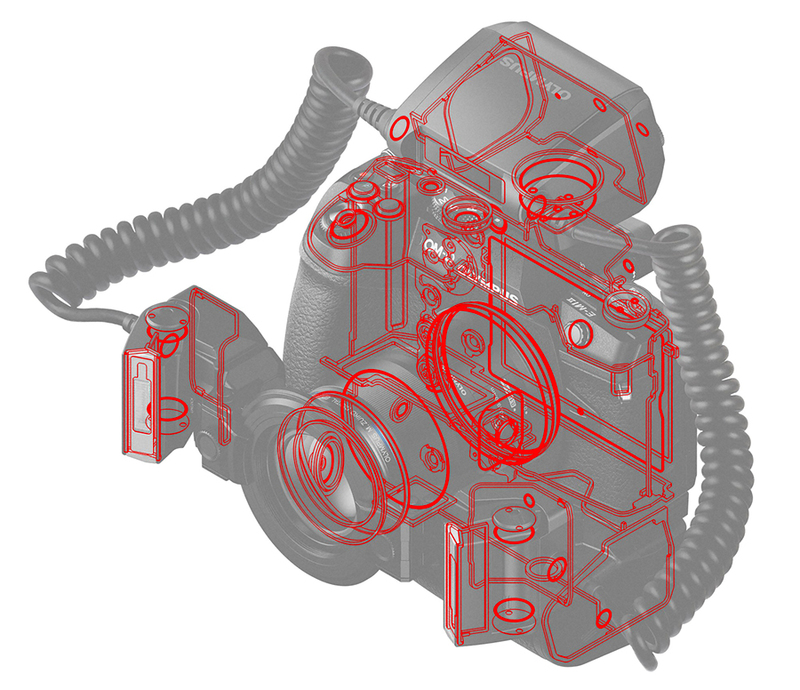 The flash heads are also located near the optical axis for efficient lighting when shooting very small subjects. 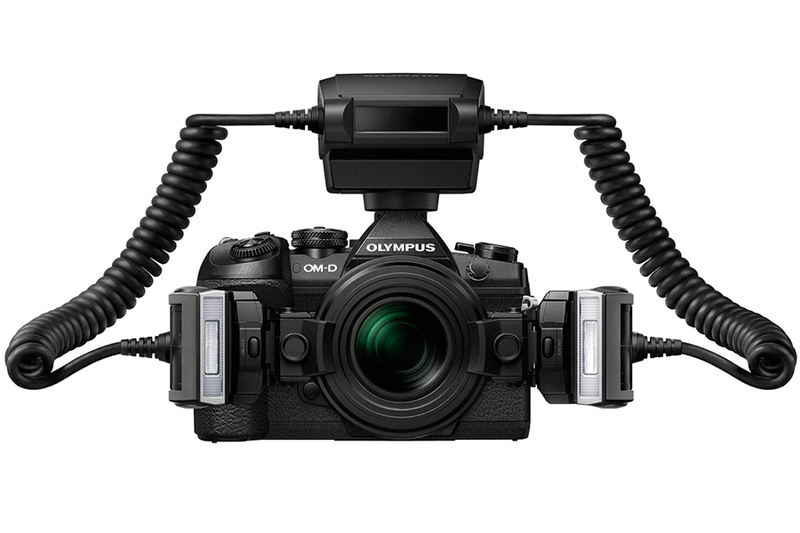 The Olympus wireless RC flash system communicates via infrared (commander only) from the front of the control section to facilitate remote firing. 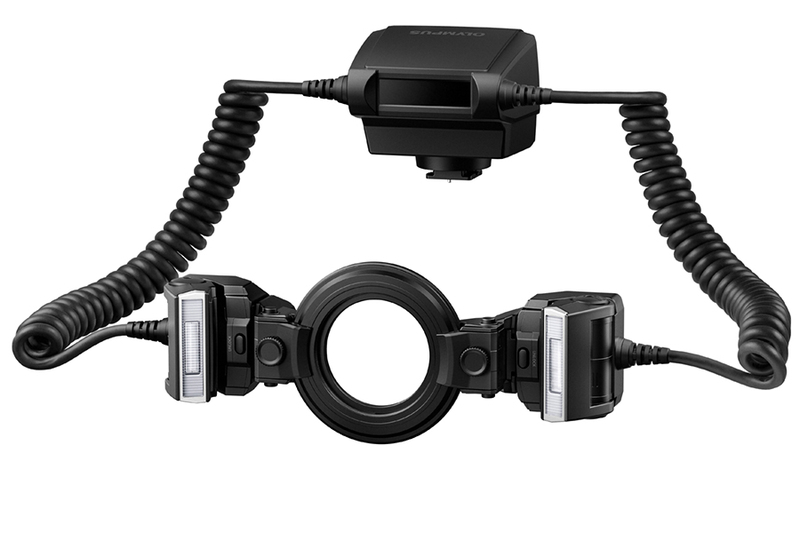 The Olympus FL-900R flash (sold separately) and other RC compatible flashes may be used for multi-unit lighting and background light. Features such as Focus Bracketing and Focus Stacking on the OM-D E-M1 Mark II (manual flash only) may be used to further expand creative expression. Frame speed is controlled to coincide with charging time and firing priority during shooting.